I am renting a car for a trip to England. The car rental agency offers insurance for damage to their car. My personal auto insurance company doesn't cover me in England and doesn't offer any international policies. So what happens if there was an accident and damage was done to someone else's car? How is that covered? How do I get protection for damage done to their car? thank you!! As the other answer implies, in the UK it's obligatory to drive in the UK with third party insurance. 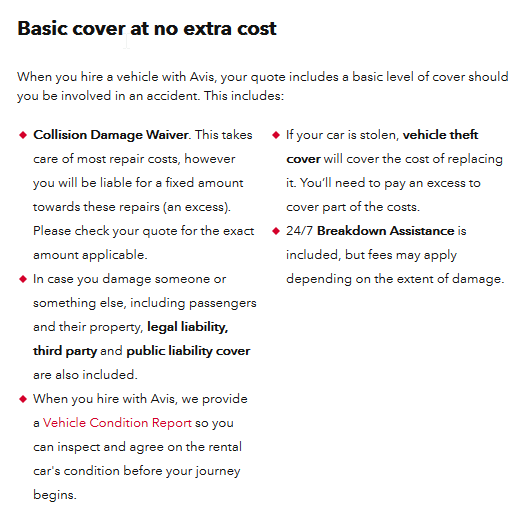 For a rental car, that isn't very helpful as the rental car company could be fully insured themselves, but still require you to pay an arbitrary deductible amount should an accident occur. Typically, renting a car in the UK without fully comprehensive insurance means that you could be liable to an excess amount of anything up to GBP 2000 or so depending on the rental car company. To reduce it you could pay the rental car company up to GBP 30/day for insurance, rent via a third party company that has negotiated a lower excess, or you could purchase a third party rental car excess insurance policy. I have one that covers me for any number of rentals per year and costs less than GBP 100 per year. I have had occasion to use it with a stolen car that would have cost me GBP1000+ so it has worked out for me. I do rent for 3 or 4 months per year though. UK rentals should include 3rd party liability and damage to the car (typically with a relatively large deductible called 'excess'). Avis UK gives a list of standard and optional insurance types here. See the 2nd item under "Basic cover at no extra cost". Not related to your question directly, but there have been a number of complaints of lack of transparency in top-up collision insurance cost, and fairly unreasonable and un-negotiable charges for minor damage such as scratches. Covering the 'excess' which could amount to as much as GBP 1000 with optional insurance purchased through the company can cost a lot of money (and the cost is reportedly sometimes not disclosed until you are at the counter). You may have coverage through a premium credit card (or not). Not the answer you're looking for? Browse other questions tagged automobiles insurance rental or ask your own question. How to deal with insurance excess when renting a car abroad? Is there a cheaper alternative to car rental insurance in Mexico? Do I need any additional insurance from the car rental? Do I need rental insurance when renting a car in the USA? What exactly is covered with this Icelandic car rental?